Sometimes you just need an old favorite (with a twist) from your college days. Sometimes, I just have to indulge in Easy Ceviche Tacos. The night before you wish to devour, rinse your shrimp, then put them in a bowl and add the lime juice. Refrigerate overnight. This is how the shrimp is "cooked" so don't cheat on this. It's kinda a meal-killer if you don't let them soak until the shrimp is pink all the way through. The evening you're ready to eat, drain and discard lime juice from shrimp and set aside shrimp. 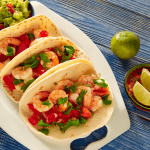 Chop onion, tomatoes and jalapeno and toss with the shrimp. Layer into tortillas with some cilantro for garnish and enjoy!